Pa'rus Trail - This 3.4 mile round-trip on a fairly level paved trail travels from Canyon Junction to the southern end of lower Zion Canyon. This is a great path for those who want to bike with family and friends, push a stroller or use a wheelchair. This is the only trail in Zion where pets are allowed, but they must be on a leash. Bring a picnic and enjoy the river that runs alongside most of the trail. Be warned however that it's loud when bikes pass over the bridges and you are down at the river. The trailhead /trailend at Canyon Junction is a shuttle pick up and drop off and there is a small parking area nearby. Canyon Junction is the intersection of Zion Canyon and SR-9 (Zion- Mt. Carmel Hwy). From the trail or from the Zion Human History Museum see if you can spot Crawford Arch on Bridge Mountain. This trail does not get much shade so if you are walking it, opt for an early morning or later evening stroll. Pa'rus is a Paiute word meaning "bubbling, tumbling water, " and the trail probably was named because the Virgin River runs alongside it. 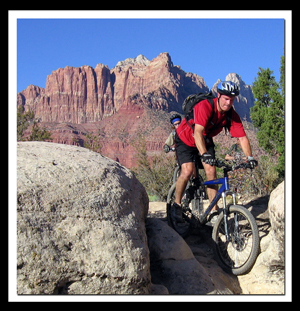 Biking in Dixie National Forest - There are two sections of Dixie National Forest that are near Zion. Cedar Mountain, on SR-14, near Cedar Breaks National Monument and Red Canyon, on SR-12, near Bryce Canyon National Park. Red Canyon is located along Scenic Byway 12. A beautiful bike path winds along the rock formations and forested lands of Red Canyon. It is located 9 miles before the entrance to Bryce Canyon. Cedar Mountain is on SR-14 between Cedar City and US-89. There is camping, fishing, hiking as well as biking. 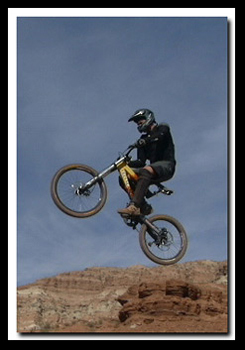 Bike rentals are available at Navajo Lake. Photo: Greyhair biker, Wade Liedtke, loves riding in Southern Utah. Wade is an advocate for developing bike trails and protecting the environment at the same time. Both Wade and Mark Mc Farland, who is in the upper picture, are avid posters in the Outdoor Community, Bogley. Both photos are taken by Justin Mc Farland, moderator in the Bogley Outdoor group. Losee Canyon Trail - This 2.9 mile moderate trail is open for hiking, bikes and horses. The trailhead is at the bottom of Losee Canyon. This trail connects with the Cassidy trail. Ledge Point Trail - This .6 mile easy trail is open to hiking, bikes and horses and ends at an overlook of Red Canyon. Rich Trail - This 2.1 mile moderate to strenuous trail is open to hiking, bikes and horses. This trail connects with the Cassidy Trail. Cassidy Trail - This 8.9 mile strenuous trail is for hiking, bikes and horses. The trail is named from the infamous Butch Cassidy who used sections of the trail. Thunder Mountain Trail - This 7.8 mile moderate to strenuous trail is for hiking, biking and horses. The red rocks on the lower section of the trail are outstanding. Barney Cove Trail - This 1.9 mile moderate trail is open to hiking, biking, horses and ATV's. This trail is used primarily as a connector trail between the Casto Canyon and Fremont ATV trails.